Beginning along the main Yellowstone National Park highway between West Thumb and Lake Village, the loop trail up the steep east side of Elephant Back Mountain reaches one of the best elevated viewpoints of Yellowstone Lake - although most of the route is forested, the trees open out as the path approaches the rim of a plateau, 1.5 miles from the shoreline but 900 feet above, allowing a great vista over the northern part of the lake and the rugged Absaroka Range to the east. The loop is 3.6 miles long and fairly easy apart from the short, strenuous climb of 300 feet to the top of the plateau, and it takes between 1.5 and 3 hours. The Elephant Back area is a favored location for grizzly bears, a factor that sometimes forces closure of the trail in early summer, and the danger of bear encounters is reinforced by three separate cautionary notices at the beginning of the path. Trail map for Yellowstone National Park. The Elephant Back Mountain Trail starts at a smallish parking area along the Grand Loop Road near Lake Village, 1.1 miles south of Fishing Bridge Junction; just across from Lake Lodge and a group of employee residences. A topographic map and the usual information about travel in the Yellowstone backcountry are posted at the trailhead. 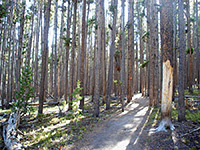 The route is alongside the highway a short distance then into the woods, past a connecting path to the employee area, over an open corridor beneath some powerlines, and into deep forest, formed of particularly large, tall lodgepole pine trees, all undamaged by wildfire. There is little undergrowth so the surroundings are open and airy - helpful when looking out for bears. The trail climbs a little, flattens out for a while then climbs some more up a shallow ravine, to a junction at the start of the loop section. Left seems to be the usual direction to proceed, and this path soon makes the major ascent up the east face of the mountain, though still without any proper views as the tall trees grow all the way up the hillside. 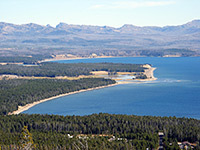 The trail switchbacks up a steep gully to the plateau above and moves southwest along the rim until emerging into a patch of open ground at the one clear viewpoint, from where all of the north shoreline of Yellowstone Lake is visible, including Pelican Creek, Storm Point, Mary Bay and Steamboat Point with Stevenson Island prominent in the foreground. 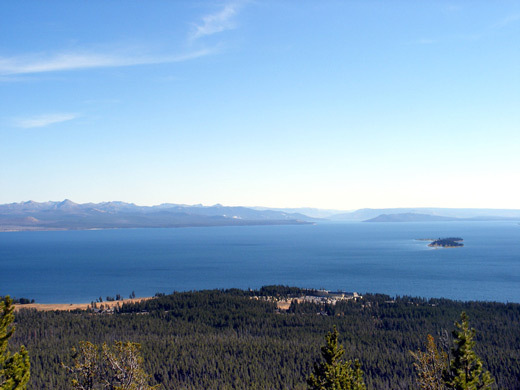 The perspective is rather narrow, however - only about 120° of the horizon can be seen, as trees hide the landscape in the other directions. After the observation point, the path moves away from the cliff edge into flat land covered by rather smaller trees, turns northeast, and reaches the rim again after half a mile. The ground hereabouts is scattered with many small pieces of obsidian, relics of Yellowstone's volcanic past - Elephant Back Mountain is actually part of an old lava flow, hence its low, rounded shape, in contrast to most of the peaks in the national park which are tall and jagged. Views are much more limited as the path crosses the cliff edge for the second time, and soon the trail is descending back to the tall, deep pine forest, via an equally steep set of switchbacks. The loop is completed by a short walk through a level, cool part of the forest where the trees grow particularly tall and close together.